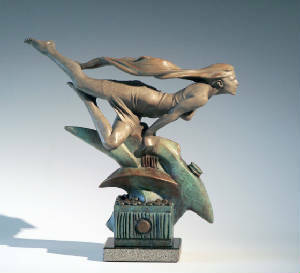 Bronze on granite base. Embedded vase w/lid. Size 11"x 12 x 5". Limited edition of 50. A FEW WORDS FROM THE ARTIST: "She is looking forward to the future with enthusiasm. The wind blows hard, a metaphor of life coming at you. She's flies on the wings of creativity. Gravity seizes to exist yet she holds on well grounded. 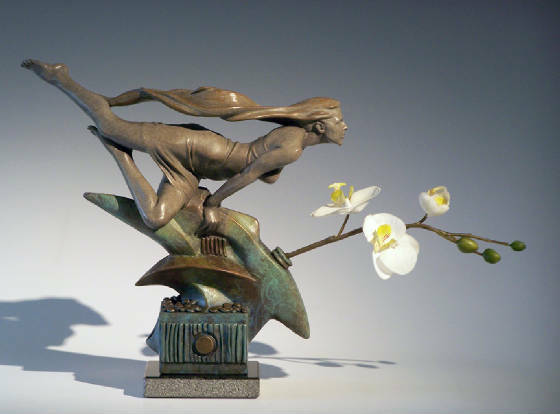 I was sculpting on this piece in a gallery when a group of women traveling together came over, everyone of them holding an orchid. One of them gave me her orchid and I spontaneously stuck it in the clay. Voila, it looked fantastic further enhancing the spirit of the piece. So it became a vase as well as a sculpture. Quite unusual. If you look carefully you will find that she is my self portrait. When I have guests over for dinner I place her on the dining table so we have both art and flowers to enjoy. The composition is horizontal so it doesn't obstruct the view across the table. The abstract shape below is perhaps a reference to an unforgettable moment in my life. Shortly after I relocated to the US I was walking on a beach and noticed to my amazement that a group of dolphins were following me. Being completely alone there on a winter-day I shouted out over the ocean from the top of my lungs "Isn't life great" joyfully throwing my arms out in the air. As if on que one the dolphins jumped his full length in the air. What a moment that was."